Just for fun, I thought I'd try installing KDE Plasma...many thanks to those on IRC for their information. It works, but it's not ready for daily usage yet. 1. Installed only the base system from a Devuan Jessie netinstall. 2. Changed the sources to Ascii...then updated and upgraded. This gave a very minimal Plasma desktop (non of those myriad of KDE applications). It was done on a very old machine with only one processor and 3 Gbs of memory. At boot, CPU was 2-4%, and memory usage was only 180 Mbs! (32bit install on an old 64bit computer). It's usable, but it's far from ready for everyday use. Several things don't work, and I believe that's due to systemd dependencies. I checked the system for systemd, and it appeared to be the same list as a regular Devuan installation. Still, it was a fun experiment and quite surprising to see Plasma use so little resources. While it's usable, I didn't post this to get others to try it. Don't do this and expect full functionality. I just wanted to share a fun Devuan experience that I had. 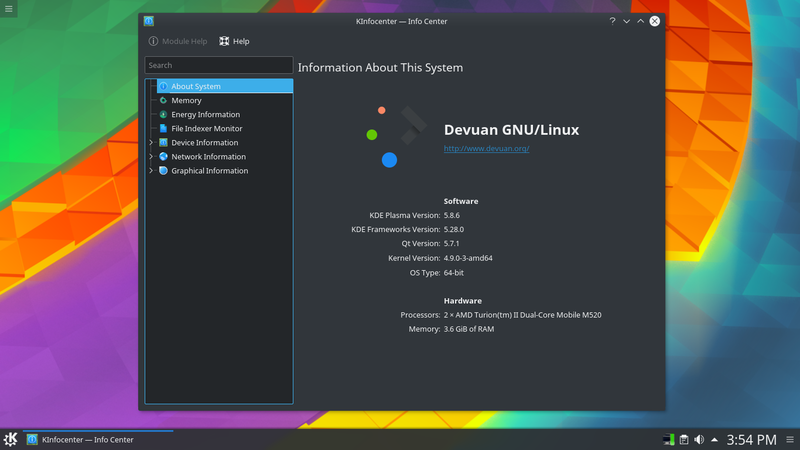 I've been running KDE Plasma on Devuan now for about a week now...and actually really enjoying it. Upgraded Jessie to Ascii, and installed a very minimal Plasma from there. Not too bad for resource usage considering it's Plasma. This is at first-boot, and resource usage is actually a little less due to having Ksysguard and the screenshot utility open...click images to enlarge. If you need more instructions, let me know. 1. Install the base system from a Devuan netinstall (remove all checkmarks when you reach the "Choose a desktop" section of the installer...then continue). 2. After the installation finishes, you will reboot into a CLI interface. 3. After signing in and becoming "su", change the sources.list from jessie to ascii...and include contrib and non-free if needed. The choice is up to you depending on whether you want pulseaudio or not. You will then boot into your new Devuan Plasma desktop. For some reason, it wouldn't install until after I had installed everything else and booted into the desktop. I also replaced udev with eudev according to the instructions on the Dev1 Galaxy Forum. Hi your majesty Devuanor. All fine and great. But why is sddm running fine in artix free of systemd, it is actually the default DM, but is having problems here? The only logical explanation I find is that they ARE ALL infested in one way or another, and artix decided to clean sddm, devuan decided on lightdm. I was reading yesterday of the new release of the enemy's core 235, that they have spent much time in altering the sysctrl aspects of shutdown, reboot, etc. Too many daemons to put back in the cage I guess and let the mothership know about it? I can't answer as to why sddm has problems on Devuan. The hiccups are as you pointed out though...there are no shutdown or reboot options in sddm on Devuan. Sddm does work as far as logging in to the desktop though. With this latest build, I was pleasantly surprised, because the last time I tried using Plasma on Devuan, none of the shutdown/reboot etc. utilities worked from the desktop menu either. Now they do. I also built a minimal Devuan Ascii LXQt. It works great; however, only the Logout option works from the menu. Shutdown, reboot, etc. don't. I tried the execute command for LXQt's shutdown in the terminal, and it threw up an error about needing something from systemd. So, I installed obsession and qshutdown to try them both. Funny thing is, obsession will shutdown/reboot, but its logout feature doesn't work. Qshutdown only handles shutdown, reboot, and one other service that I can't remember at the moment. You can also set those options to happen later at a specific time if desired. So, after testing them both, I use the native logout option from the menu to logout. I changed all of the others to "NoDisplay=true" except the "Leave" option, and changed it's Exec= to qshutdown. How was that for a bunch of information that wasn't needed? LOL! I'm not up on everything, but it seems the Dolphin/KDE devs are trying to make it nearly impossible to open Dolphin as root. If anyone tries making yourself a Plasma desktop as I described above, you will end up with a Root Terminal in your applications. If you try opening Dolphin as root with the normal terminal, it'll spit out a bunch of errors and not open. If you use the Root Terminal to open Dolphin as root, it works. Edited to add: Adding yourself to the sudoers list allows you to open Dolphin as root with the normal terminal...but it's ugly. LOL! Couple of other things, and I'll edit the post of packages needed. 1. kdesudo - can't automatically open USBs when plugged in without this. Could still open the file manager to access them, but I couldn't open them from the prompt when inserted until installing kdesudo. I was downloading some different wallpapers through the native KDE application, and several of my own wallpapers that I had submitted to XFCE-Look were on there! I'm stinkin' famous! LOLOLOLOLOLOLOLOL!!!!!!!!! For anyone interested, I'll make a "How to Miyo Devuan LXQt" soon. Believe it or not, it's a little more involved than Plasma. That's strange, about LXQT. I thought the reason Artix chose LXQT for a desktop iso was that it was the simplest to port and the most init-system independent. I think it is more miyo to work on awesome or i3. PS I'm still waiting on your review you know! Booting up at 270 MBs of RAM. Eat your heart out Xfce... LOLOLOL!!! Edited to add: this is a minimal installation following my instructions above. 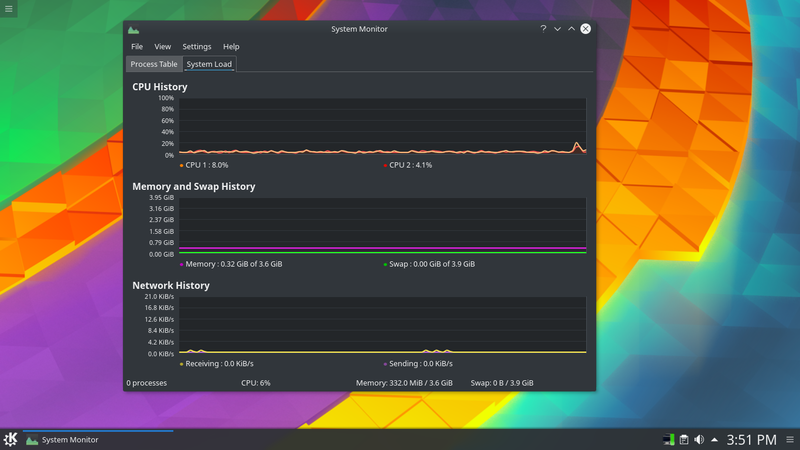 I tried the full KDE installation first, and it was booting up at around 500 MBs of RAM. Good luck! Hey...you might already be aware, but Plasma is offered now in the Ascii .iso. I did all of the things above before it was officially offered. Here how to make Devuan faster than each other Linux/Unix, tested with Devuan KDE, compared to Devuan Xfce, KDE-Neon, Kubuntu 18.04. To whom is interested, Enjoy!